Female with wings fully developed or, more commonly, with wings apparently shorter than thorax width (see Variation below). Body legs and antennae mainly yellow, with weak shadings. 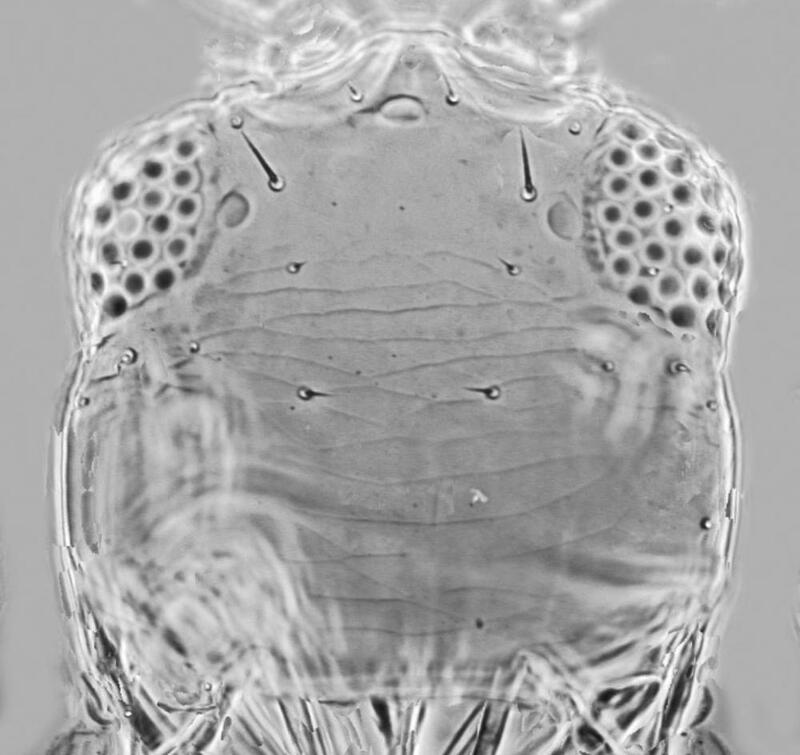 Head much broader than long, flattened dorsoventrally; 3 pairs of small ocellar setae present, pair III anteromesad of posterior ocelli; ventrally strongly asymmetric with large mandible and massive mouth cone. Antennae 8-segmented; segments III–IV with small forked sensorium. Pronotum without long setae, 2 pairs of posteroangular setae slightly longer than discal setae; posterior margin with pair of minor setae medially between the major pair. Metanotal median setae small, arising close to anterior margin; campaniform sensilla absent. 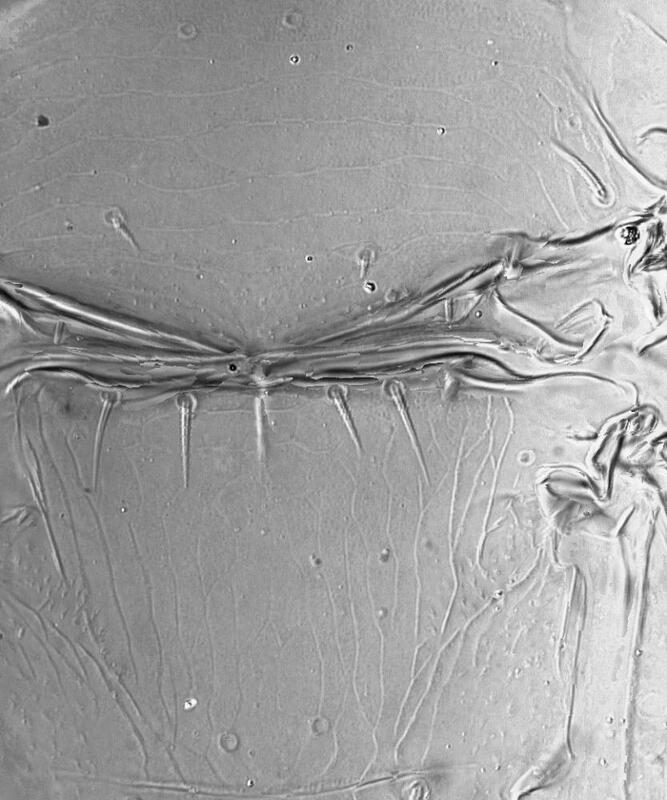 Fore wing with two complete rows of veinal setae. Abdominal tergites with median setae small and wide apart; tergite VIII sometimes with rudimentary ctenidia anterolateral to spiracle, similarly weak ctenidia on VII; posterior margin of VIII with no comb. Sternites with no discal setae. Females of this species commonly have the wings shorter than the thorax width. However, the apex of these short wings is curiously irregular appearing to have been cut off; they do not have the normal form of short wings that occur in micropterae of other Thripidae. Moreover, these females have ocelli present on the head. Despite this, de-alation has not been observed in this common species on Yucca, and although this behavior is known in several unrelated species of Phlaeothripidae, it has not been recorded in any Thripidae. The significance of the short wings in Arpediothrips requires examination of series of pupae to determine if these have long or short wing-buds. Only two species are described in the genus Arpediothrips, but the significance of the second species, A. mexicanus Moulton, requires further study as it also lives on Yucca. The genus is closely related to Frankliniella in the following character states: weak ctenidia present anterolateral to the spiracle on the eighth abdominal tergite; forewing with two rows of setae; pronotal posterior margin with pair of minor setae between the pair of median major setae. It differs in the superficial character states of the broad head and short pronotal setae. Yucca brevifolia, Y. schidigera, and possibly other Yucca species (Agavaceae) (Wiesenborn, 2006).